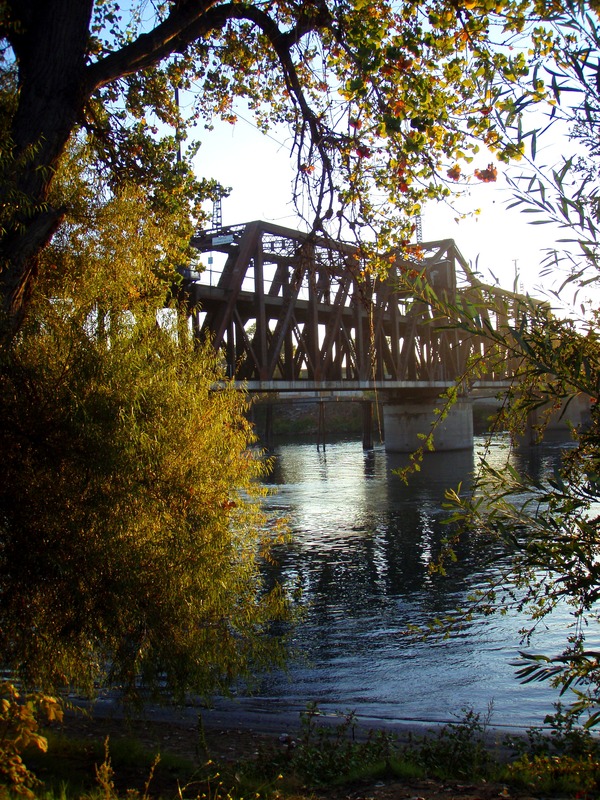 The Tuolumne River is a tributary the San Joaquin River, which flows into the Delta. Of the 38 million people affected by the Bay-Delta Conservation Plan (BDCP), at least 60 phoned in to get an update last week. The public meeting held in Sacramento was chaotic, with sounds of dogs barking, neighborhood chit-chat and the double-toilet-flush from the call-in listeners who forgot to mute their lines. Despite the bizarre atmosphere, serious clarifications were made regarding the big-picture plan to build two giant tunnels through or around the Delta—the largest estuary on the West Coast. Gov. Brown’s tunnel conveyance plan continues to dance around the science, although the project’s leaders have publicly claimed to embrace it. The latest news? The current plan being pushed ahead is an operations proposal known as Alternative 4. That alternative intends to raise the limit on exports for south of delta contractors from an average of 4.9 million acre-feet to 5.3 million acre-feet. And that may be a problem—4.9 isn’t an arbitrary number. It’s a vetted biological opinion put in place to keep key species, such as delta smelt, chinook salmon and steelhead from perishing forever. Among other things, water diversions and pumping have severely impacted the beleaguered estuary. Giant pumps sit in the south Delta and send water uphill to drier parts of the state, including Los Angeles, the Central Valley and Santa Clara. When the pumps operate, rivers flow in the reverse direction and entrap fish trying to spawn. On average, 95 percent of juvenile San Joaquin River salmon and 60 percent of Sacramento River salmon don’t survive migration through the Delta. The biological opinion limits the damage. “It was widely recognized that the alternatives analyzed in the February effects analysis would lead to further fishery declines and the likely extinction of several salmon runs,” said Kate Poole, Senior Attorney for the Natural Resources Defense Council. “The state has promised that BDCP would be a science-driven process and would recover the ecosystem and imperiled salmon and other fisheries.” Choosing Alternative 4 means that the process is not being driven by science, Poole added. What’s driving the process seems to be the state and federal contractors who are funding the BDCP, and their interest lies in increasing water exports. Regardless, fish and other wildlife need fresh water flowing through the system, and a lot more than they’re getting. The public trust recommendations for flow, as set forth by the State Water Resources Control Board, would limit exports to 3.7 to 3.9 million acre-feet. That’s more than a million-acre feet less than the current proposal. But there is a caveat. The current plan suggests that by increasing land habitat more water can be exported—although it is unclear whether scientific studies will validate that. State and federal wildlife agencies are responsible for permitting the BDCP, and they are trying to ensure that science does come first, but they’re still working out the numbers. Remediating habitat is an important part of that process as well. The Delta has only five percent of its original wetlands intact. The costs are another matter. It’s an expensive project and who will pay for it appears to be in flux. The project cost hovers around $23 billion, with an additional $1.1 billion in debt servicing for 35 years. The debt costs nearly double the price. Currently, contractors are set to pay 75 percent of the costs, and taxpayers the other 25 percent. But those percentages will be adjusted in the future, as noted at the meeting. Funds from state bonds provided 78 percent of the financing for the construction of the original State Water Project. The current alternative decreases the intake size of the proposed tunnels and limits tunnel exports to 6.5 million acre-feet a year. But that’s an incomplete picture of the system. The pumps in the southern end of the Delta will still be there, and they also have a similar export capacity. Thus, the only physically limiting factor is the size of the California Aqueduct. The system would have the capacity to export nearly 10 million acre-feet a year. Mike Taugher, Communications Director for the California Department of Fish and Game, carefully noted that the state pumps have always had the capacity to export more water, but they’ve always been limited by operational regulations. What next? More meetings and a forthcoming Environmental Impact Report. What’s really happening, and will Gov. Brown listen? 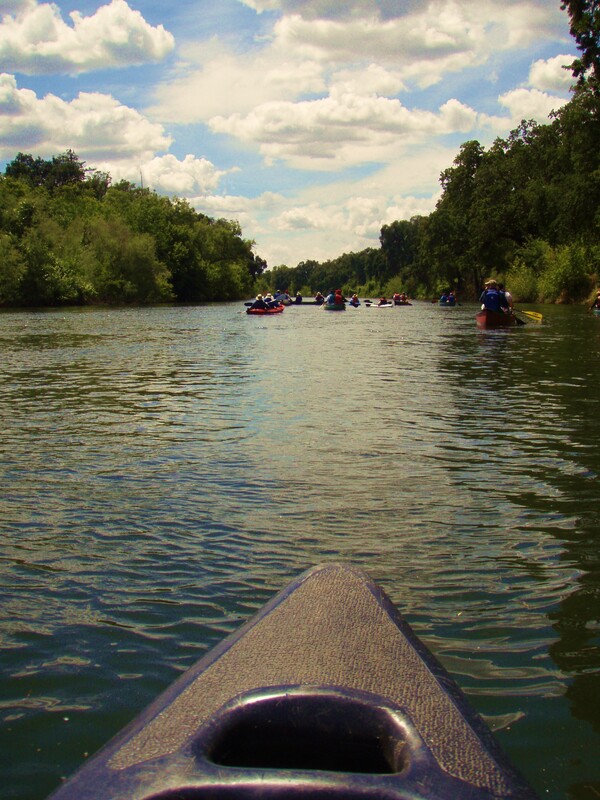 The Sacramento River is the largest river in the state. 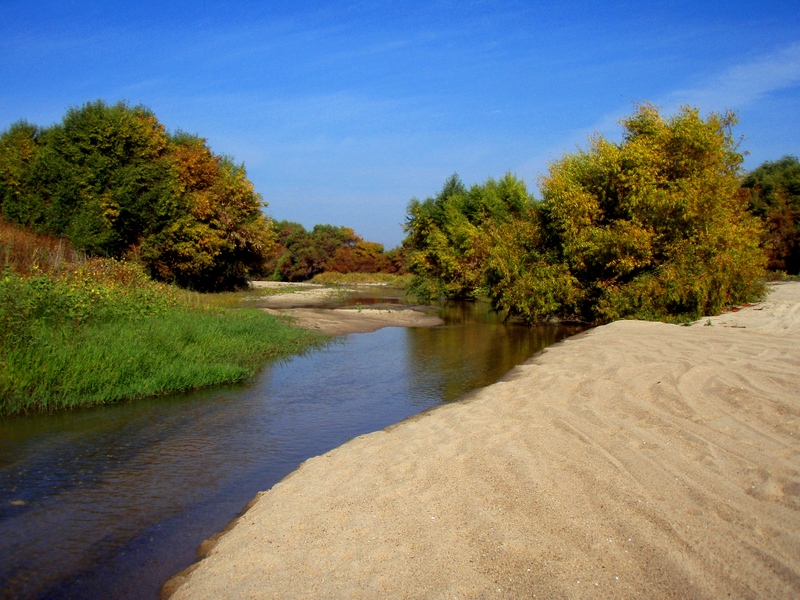 It carries nearly one-third of the total annual runoff of all California streams. Tragedy might be striking. Just 10 minutes away is the roar of Interstate 5, one of California’s major freeways. Twenty minutes farther is Sacramento and the buzzing State Capitol, where the fate of this farming community, the Delta, the state’s river system, and the largest estuary on the West Coast will be determined. The Delta is the heart of the state’s water resources. Most rivers flow into it, the ocean meets it, key species migrate in and out of it, 25 million people draw water from it, and a large portion of agriculture relies on it to irrigate crops. And now, Gov. Jerry Brown wants to forge ahead with a $23 billion plan to build two massive tunnels underneath or around the Delta. 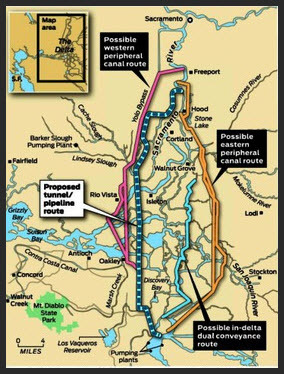 The governor’s proposed Bay-Delta Conservation Plan (BDCP), also known as the tunnel conveyance system or peripheral canal, would carry part of the Sacramento River underneath the Delta in two 35-mile long tunnels to the California Aqueduct. There, the water would be pumped uphill to cities and farms in more parched regions of the state, including the southern Central Valley, Los Angeles and Santa Clara. But it’s unclear what Brown is trying to get done. The project would continue to move water from one part of the state to another, with questionable benefits for citizens, farmers, fish, fishermen and even state and federal water contractors, who have funded the project thus far. The differing perspectives of a Delta farmer, a seasoned environmentalist and a Republican supervisor show the complexities and contentiousness of what lies ahead. 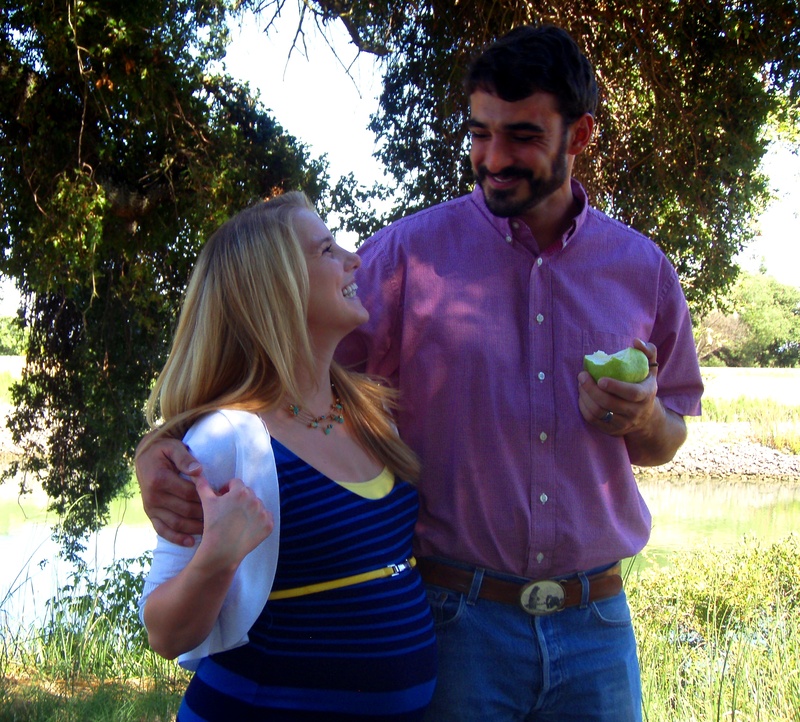 Delta Farmer Brett Baker and his wife Meredith stand near their 40-acre farm in Courtland, CA. The couple is expecting their first child in October. Acre to acre, Delta land is one the most productive farm areas in the state. The toxic land that Baker refers to is on the west side of San Joaquin River in the Central Valley. The area has long had problems with salinity and selenium, and it’s also a primary importer of Delta water. Salinity on the west side can be flushed out with water, provided there is drainage. But there isn’t excess water or drainage, and there may never be. The taxpayer cost of fixing the drainage problem is $2.6 to $7 billion. Only $346 million in funds are currently allocated. Selenium presents a more significant problem for the west side. It cannot be safely dispersed into the environment. It bio-accumulates and in large quantities is toxic to wildlife, livestock and humans. In the 1980s, Kesterson Reservoir had to be closed, because of the mass bird and livestock deformities that were discovered there due to selenium build-up. The area has since been cleaned up, but pollutants are still flowing into the San Joaquin River, and more water will not fix the problem. So why construct a canal or tunnel conveyance system and route water there? The West Side of the San Joaquin River. Graphic courtesy of the EPA. A portion of that water flows elsewhere, to the Metropolitan Water District and the Kern County Water Agency, for example. The giant pumps that sit in the southern part of the estuary entrap and kill thousands of fish annually. The pumps also alter the habitat of the estuary by creating a north to south flow across a tidal ecosystem, which would naturally flow east to west. The proposed tunnels would move the intake upstream to locations that might be less harmful to smelt, salmon and other endangered species. They also might avoid delivery disruptions associated with salt water intrusion and climate change. And Baker is right. The birds are in trouble too. 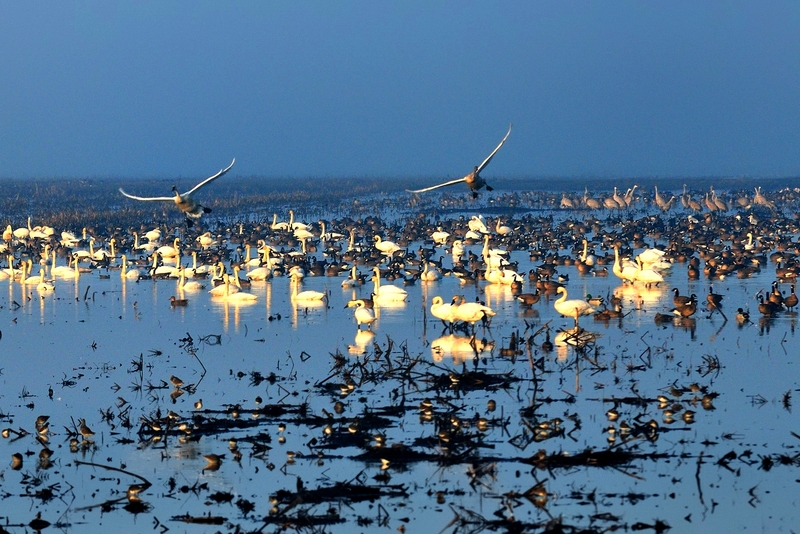 Although endangered fish species get more attention because of their effect on water exports, the Delta is a primary habitat and migratory stop for millions of birds, like tundra swans and sandhill cranes. 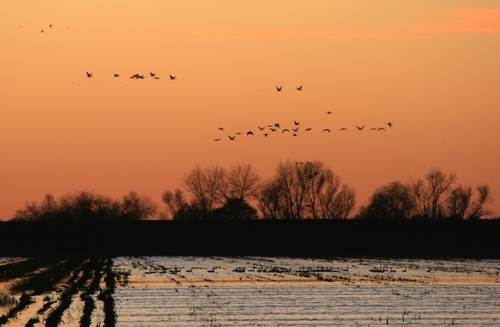 Nearly 50 percent of the Pacific Flyway’s migrating or wintering waterfowl depend on it. Altogether, the Delta is home to more than 750 species of plants and animals, 33 of which are endangered, and likely to go extinct within the next 25 to 50 years, if not sooner. Those species includes chinook salmon, smelt, steelhead, splittail, sturgeon and river lamprey, all of which are supposed to be protected by state and federal agencies. And California hasn’t left much breathing room for its once abundant wildlife, particularly in the Central Valley and the Delta, where most of the land is privately held and about 95 percent of natural wetlands are gone. And water, the other primary habitat, has been over-allocated to such a high degree that little is left for plants and animals. All total, water rights exist for 531 million acre-feet, which is nearly 10 times as much as is annually available (63 million acre-feet). Staten Island with sandhill cranes. The area works as a habitat and a farm. Photo courtesy of Leo Winternitz. Leo Winternitz, associate director of Delta Restoration and Policy for the Nature Conservancy, has been living amidst these water wars for the past 30 years. He has worked for CALFED, the Sacramento Water Forum, the Department of Water Resources, and the State Water Resources Control Board—all major players in water management. But putting that into action is no easy task. The Delta region has more than 500,000 acres of agricultural land, most of which was formerly wetland habitat. About five percent of the original environment is left. To restore a portion, the Nature Conservancy acquired a 9200-acre tract in the Delta, called Staten Island. The area provides prime habitat for sandhill cranes and other migratory waterfowl. But the $35 million land purchase has been criticized. Half of the money for the acquisition came from the state funds for flood protection, and today, it’s managed primarily as a farmland and wetland—not as a flood plain. The island is below sea level, and it isn’t ideally located for tidal marsh restoration. Still, 15 percent of the Sacramento Valley sandhill crane population and thousands of birds use the area as a winter habitat. Sandhill cranes and tundra swans fly thousands of miles in the fall to spend their winter in the Delta. Photo courtesy of Leo Winternitz. The BDCP, at least, has a cohesive plan for restoration. It may include 80,000 acres of tidal marsh habitat and up to 45,000 acres of agricultural and grasslands habitat. But that makes Delta farmers nervous, as does changing the position of the water intake system and increasing exports, which was originally part of the plan. And that’s where the project starts to hit serious trouble. 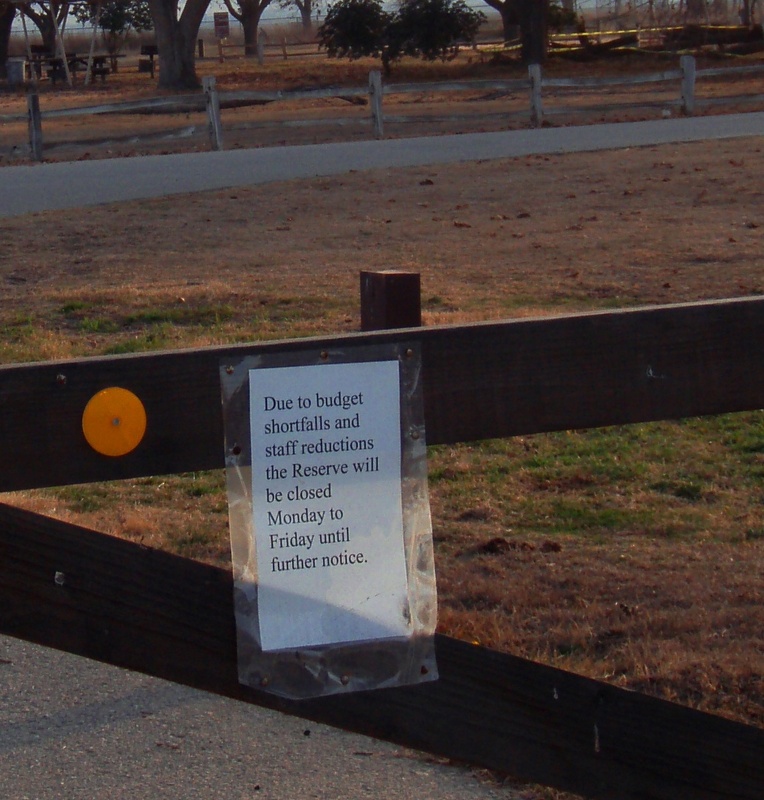 The BDCP sets off a series of agency interactions between the Department of Water Resources (DWR), the State Water Resources Control Board (SWRCB), the California Department State Fish and Game (DFG), U.S. Fish and Wildlife Service (FWS), the National Oceanic and Atmospheric Administration (NOAA) and the Delta Stewardship Council (DSC). Each agency is tasked with a particular aspect of protecting and managing the state’s natural resources. And there is a lot to protect:—California is one of the most bio-diverse places in the world. But what’s being communicated is tough medicine for everyone. The public trust recommendations for the Delta are the hub of public policy, and the agencies are circling around it. To resuscitate the system, scientific research indicates the need to increase river flows and decrease Delta water consumption by nearly 50 percent, or 13.7 to 14.6 million-acre feet. Those recommendations are supposed to play a primary role in water planning and policy—and to some extent they have. Right now, what keeps the Delta ecosystem intact are court-ordered flow criteria. 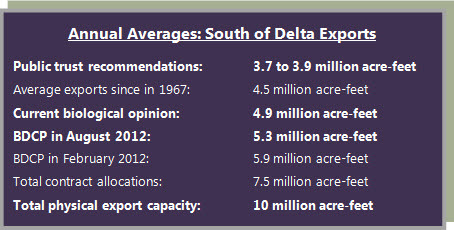 The current rulings limit south of Delta exports to an average of 4.9 million acre-feet. If you applied the public trust recommendations exports would drop to 3.7 to 3.9 million acre-feet, about 25 percent. That also means that the rest of the state, including cities, irrigation districts and farms, would have to reduce use and put water back into the system. But can California clean up? The quick and easy answer is yes. With water recycling, conservation, efficient technology and better water management, California can meet the needs of the environment, agriculture and a growing population. There is a mountain of data, coming from nearly every water agency, suggesting that improvements can be made. Conservation is the cheapest and easiest way to create to a new supply. There is more new potential water from these investments than California regularly exports from the Delta, and they come without the damage to fish or farmers. But the long hard truth is that change is difficult. DeMartini spends his mornings on his farm and the afternoons in the county supervisor’s office in downtown Modesto. Stanislaus County Supervisor Jim DeMartini knows first-hand just how difficult. In his office in Modesto, just south of the Delta, pictures of George W. Bush, Ronald Reagan and Arnold Schwarzenegger hang from the walls. 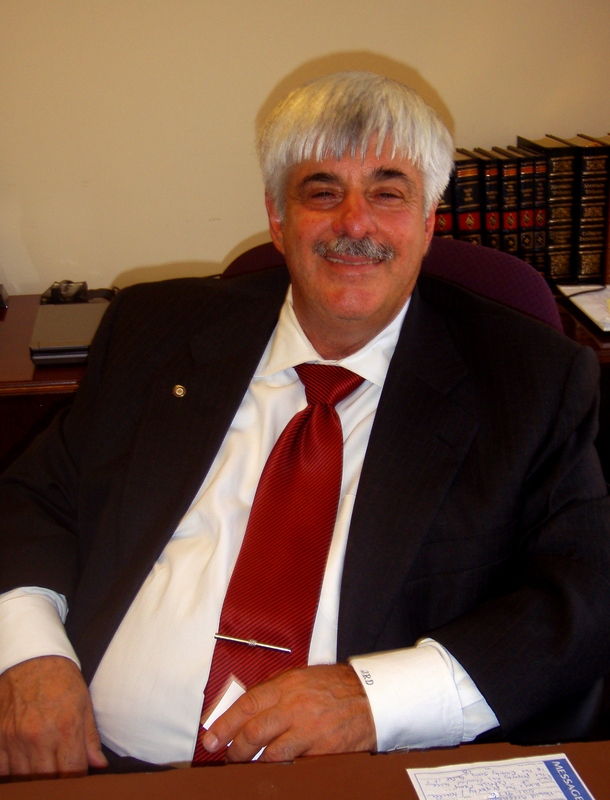 DeMartini is a Republican farmer pushing to preserve prime farmland from sprawling development. California agriculture produces half of U.S. grown nuts, fruits and vegetables. It is also home to nine of nation’s most productive counties, and Stanislaus County is one of them. DeMartini planned a workshop with the Mayor’s Association to create a land use policy for each of the nine cities. “Everyone had a scheduling problem, and I never did hear from them again,” he said. “It’s been more than a year now.” It’s surprising, since sprawl has never worked for the region. Stanislaus County has double-digit unemployment and high foreclosures—all remnants of the housing crisis. Still, the area is on the forefront of innovation. The Oakdale Irrigation District is improving its water delivery system, and the Patterson Irrigation District is building a cross-valley channel, which could transport water east to west without going through the Delta. More recently, Modesto farmer Bill Lyons sold 1,603 acres along the Tuolumne River, to be used for wildlife and wetland restoration. In general, what DeMartini is advocating has little to do with the peripheral canal or the tunnels. But his plans aren’t far from what’s likely to become state law. His proposals mirror the legally-mandated policies set forth by the state’s overarching water plan. California’s 88-year Delta Plan focuses on wetland preservation, habitat restoration, farmland protection and reduced reliance on Delta water. 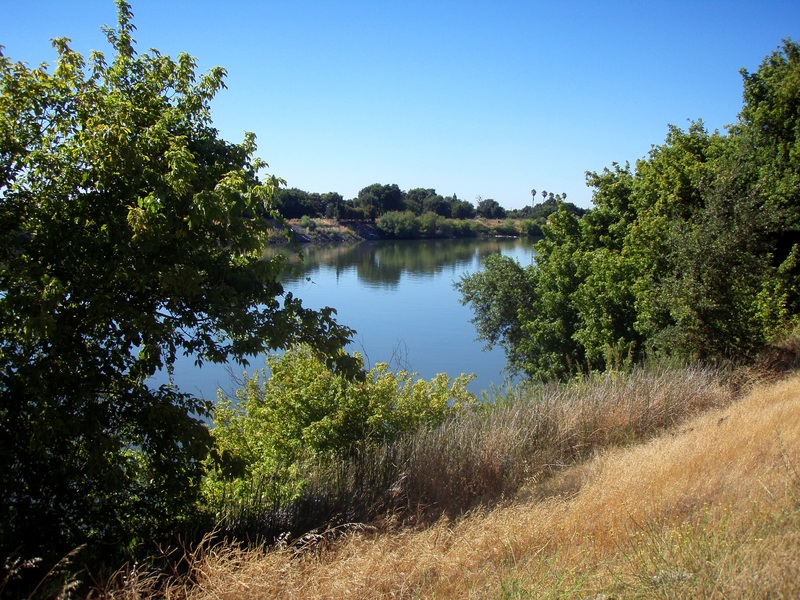 The agency putting the plan together, the Delta Stewardship Council (DSC), has an appellate role regarding the canal and conveyance system. 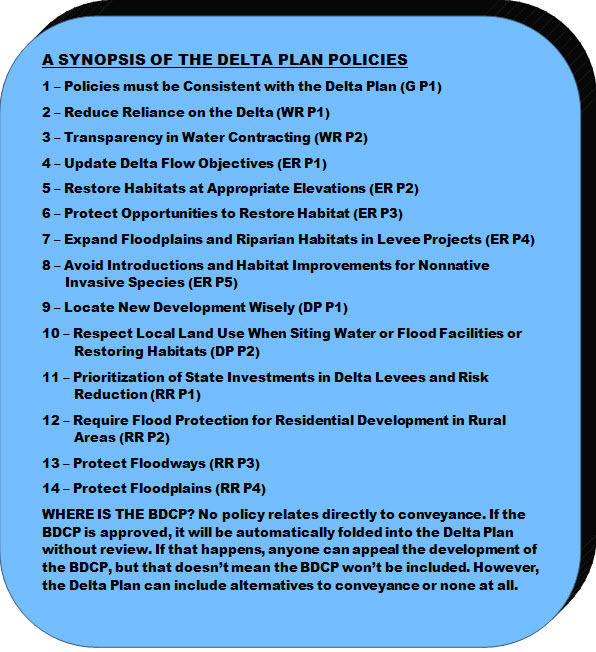 If the BDCP is approved, it will automatically be folded into the Delta Plan without review, unless someone makes an appeal. The question remains: Where will it go? 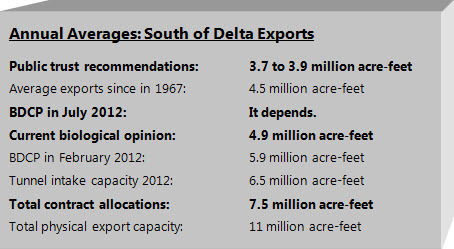 Note: This South of Delta Exports chart was updated on August 30, 2012 for clarity. The tunnel intake capacity is 6.5 million acre-feet. The total physical capacity to export water is 11 million acre-feet. A detailed explanation will follow in a forthcoming article. Stockton, CA– The City of Stockton was home to the 8th annual REXPO, whose theme this year was “Unplugged,” on March 14, 2012 between the hours of 7:00 AM until 2:00 PM at the Hilton Hotel. The event was hosted by Green Team of San Joaquin, a program of the Stockton Chamber of Commerce. The Peripheral Canal – How much water? At what cost? Who pays? Nearly two-thirds of California residents and the majority of agriculture get their water from the Delta and its tributaries, which surround Stockton in an intricate pattern of levees, rivers and farms. But the Delta faces multifaceted environmental problems, which have led to a crisis for fisheries, wildlife and water quality. The peripheral canal has been touted as the solution to the Delta’s problems, but it’s questionable whether it can provide reliable water and protect the ecosystem. The Bay-Delta Conservation Plan (BDCP) has spent more than $150 million planning for some form of peripheral canal or tunnel-conveyance system, which would route water around the Delta rather than restoring it. The BDCP is funded by 23 South-of-Delta contractors who receive water from state and federal projects. According to a Legislative Analyst Office report, $240 million is allocated for the BDCP planning process through the year 2013, and all total, the peripheral canal is currently estimated to cost $12 billion or higher; its actual costs are unknown. And the BDCP draft plan has critical missing components, according to a National Academy of Sciences Report, including clearly defined goals and a scientific analysis of the proposed project’s potential impacts on Delta species—and that’s a big piece of the puzzle. Technically, the BDCP is supposed to meet the state’s co-equal goals of ecosystem restoration and water reliability. While the Delta’s decline is due to many factors, including pollution, invasive species and loss of wetlands, the primary reasons for species decline are water diversions and excessive pumping in the estuary. 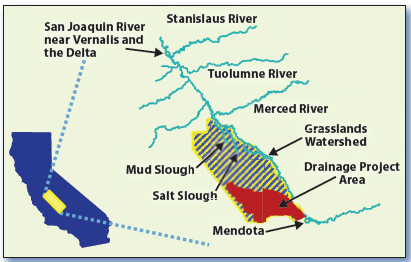 The San Joaquin and Sacramento Rivers are the Delta’s primary tributaries; the San Joaquin River has often run dry due to diversions, and the Sacramento River, which once flowed out to sea, is often used to convey water to federal and state pumps, which send the water uphill and south to farms and cities in Southern California. The reduction in freshwater flow has eliminated much of the habitat, and as a result, populations of flow-dependent species have collapsed, including Chinook salmon, steelhead and Delta smelt. To address this, the state passed the Sacramento-San Joaquin Delta Reform Act in 2009, which required the State Water Resources Control Board (SWRCB) to develop flow criteria to protect public trust resources and a suite of native fish. The SWRCB public trust recommendations indicate the need to reduce use by 13.7 to 14.6 million acre-feet annually, which is about 22 percent of the state’s annual average water supply, or almost half of the Delta water supply. 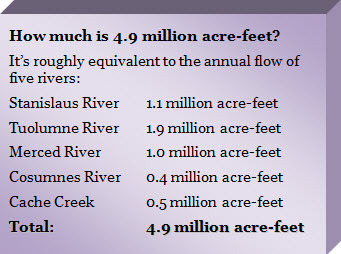 That’s roughly equivalent to the annual flow of six Sierra Nevada Rivers, including the Tuolumne, Merced, Stanislaus, Feather, Yuba and American. While the SWRCB must balance economic needs with ecosystem needs, those flow recommendations imply that all Delta water users, including state and federal water contractors, will have to significantly reduce use. As such, a coalition of water and power districts recently sent a letter to the SWRCB requesting a delay in further establishing the Delta flow criteria until the BDCP is further along. Thus far, the BDCP has not taken the public trust flow recommendations into account, it has no plans for a cost-benefit analysis, and the cost per acre-foot of peripheral canal water is unknown. BDCP representatives did not respond to phone calls or email requests for information. 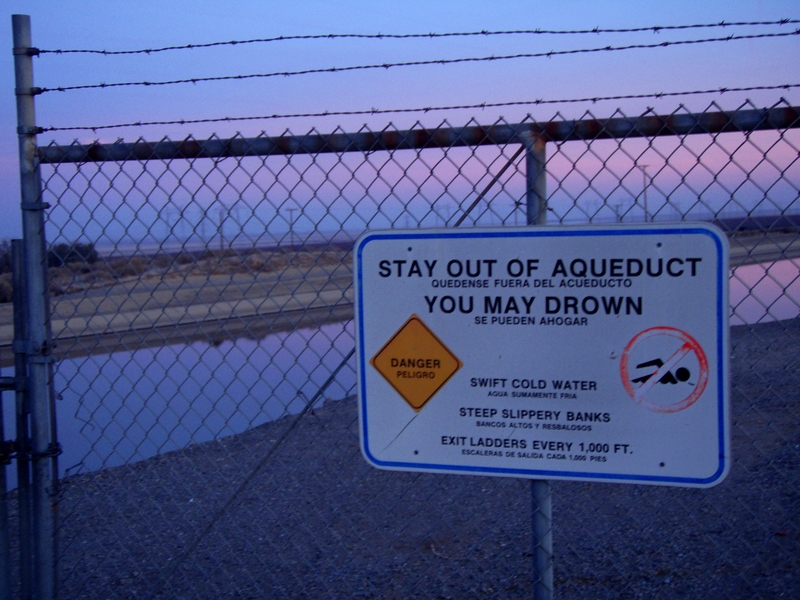 The California Aqueduct sends water south and uphill towards cities and farms. It was renamed the Edmund G. Brown California Aqueduct in December 1982. According to Dave Paulson, Chief of the State Water Project’s (SWP) Cost Branch, there are several factors that make determining costs of conveyance difficult. First, conveyance costs vary annually based on the costs of power, operation, maintenance and new construction. Second, contractors are billed only for their share of the annual costs, and it’s difficult to project the impact of a potential BDCP program layered on these existing costs. Third, the total projected BDCP costs are undetermined, the repayment period is not defined, the share of transportation and conservation costs are unknown, and no preferred alternative has been presented. However, the Metropolitan Water District (MWD) of Southern California, which supplies drinking water to nearly 19 million people, has made estimates of its own. According to MWD, water from the proposed conveyance system will cost the district $810 per-acre foot, on average. MWD pays, on average, $296 per acre-foot for Delta water, which implies that the project will increase costs without necessarily yielding a more reliable supply. By comparison, MWD conservation programs yield additional water for $118 per acre-foot. 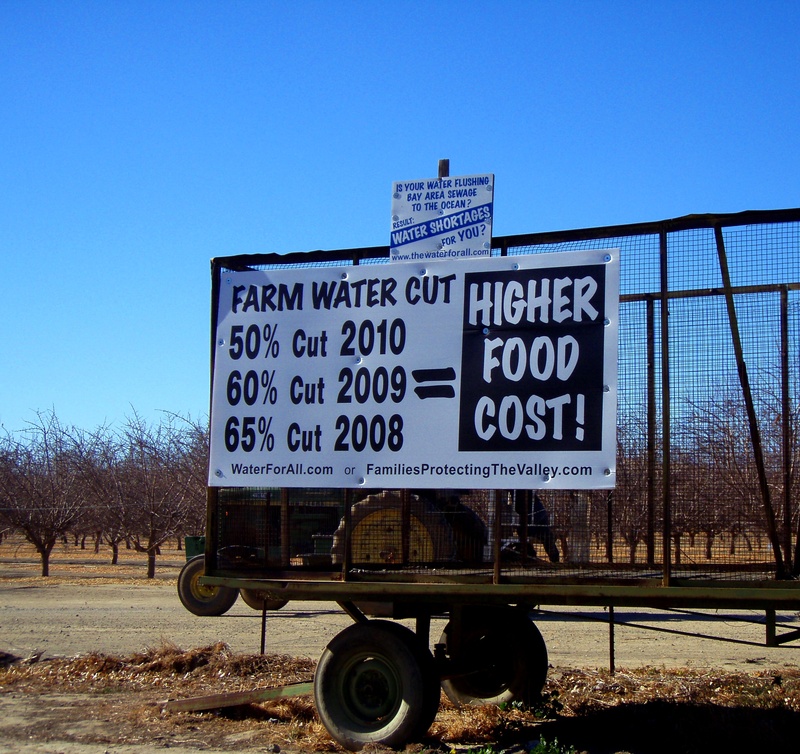 State contractors on average pay $185 per acre-foot of water, and San Joaquin Valley contractors pay about $52 an acre-foot under the current contract, which expires in 2035. The BDCP is also linked to the Delta Plan, which is supposed to establish a more reliable water supply while protecting the Delta ecosystem, as well. The difference? The 88-year Delta plan will contain legally enforceable regulatory policies. It sets deadlines for the completion of the BDCP and Delta flow objectives. To be included in the plan, the BDCP must meet certain requirements, including flow requirements and approval from the Department of Fish and Game. The Delta Plan is in the fifth draft of seven, and thus far, more than 200 environmental organizations have criticized it for failing to take the doctrine of public trust into account. The public can comment on the Delta Plan’s 2200-page environmental impact report until February 2, 2012. The sixth draft will be published in March. 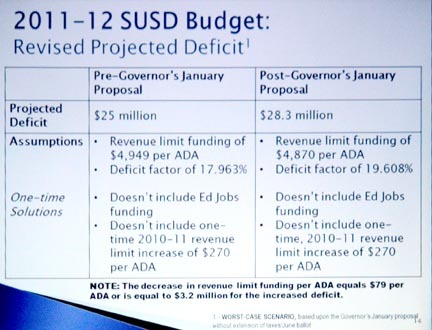 In regards to the BDCP, Assemblywoman Alyson Huber (D-El Dorado Hills) and Senator Lois Wolk (D-Davis) are attempting to bring fiscal accountability to the BDCP process. 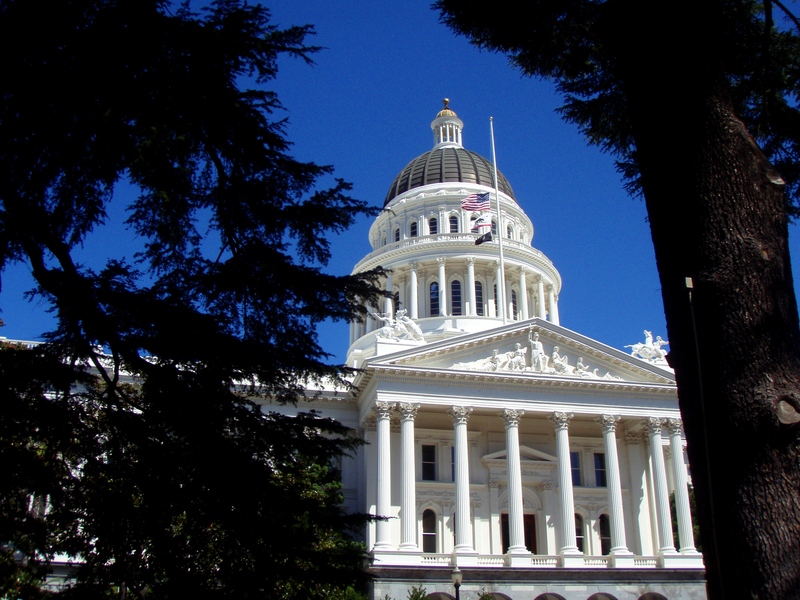 This January, Huber re-introduced Assembly Bill 550, to prohibit the construction of a peripheral canal without a full fiscal analysis and a vote of the state legislature. The bill failed on a 5-7 vote, with seven votes needed for passage. “We have made great progress from last year, and I am still committed to pressing for a full fiscal analysis and a vote of the legislature before any Delta water conveyance program can move forward,” Huber said. Gov. 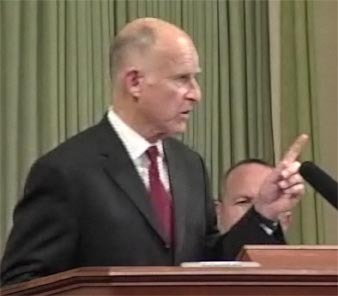 Jerry Brown, in his 2012 state of the state address, expressed his support for the BDCP, but more recently indicated that he would support delaying the $11 billion water bond currently on the November ballot, saying an overhaul of the state’s water system can begin without voters approving borrowing this year. Brown advocated the peripheral canal in his last term as governor, but it was defeated in a referendum in 1982. Notably, his father, former Gov. Edmund G. Pat Brown, helped develop the State Water Project, when he served from 1959 to 1967. 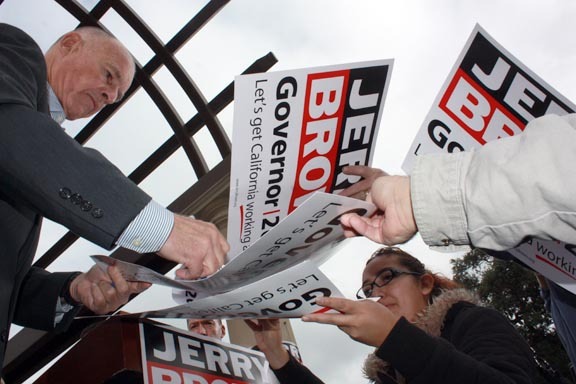 Despite Brown’s enthusiasm, the state’s budget woes present a formidable roadblock. The general bonds that fund large infrastructure projects are financed by state taxpayers who pay the interest and principal out of the General Fund. According to the state’s fiscal outlook, the General Fund cost for debt service on infrastructure bonds is currently $6 billion for 2010-11 and $7.2 billion for 2011-12, and will continue to rise until 2015. Funds from bonds provided 78 percent of the financing for the construction of the State Water Project. Wonder what happened to water conservation? See the next article in this series: Water Conservation, Recycling and California’s Future.